Now I’m thinking why did I wait so long to get one. And this thought comes after decades of riding an upright over tens of thousands of miles. 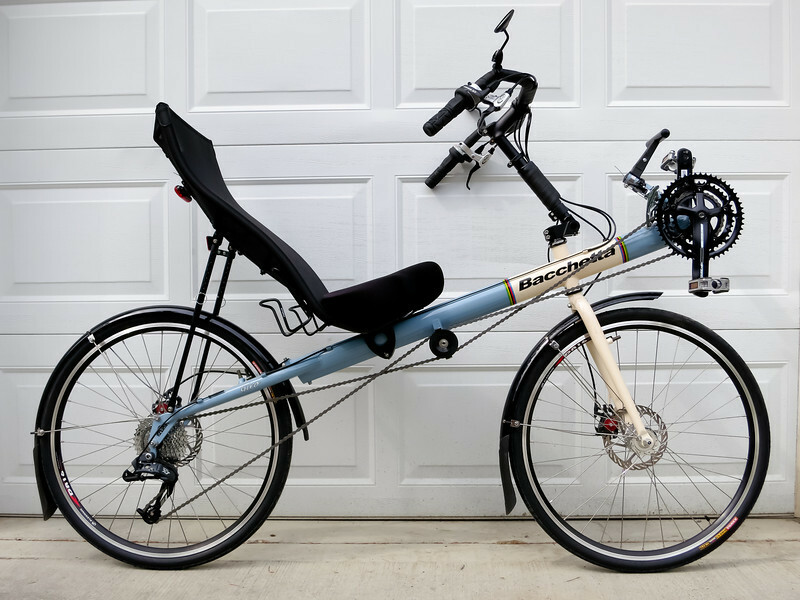 Practical insight first: it’s more comfortable than an upright…the seating is indeed comfy, requires no in-ride adjustments, body lotions, or derriere break-in period. No weight on the hands, no numbing on long rides. It’s faster on flats and downhills due to the reduced wind profile. On the other side: it’s slower going uphill. 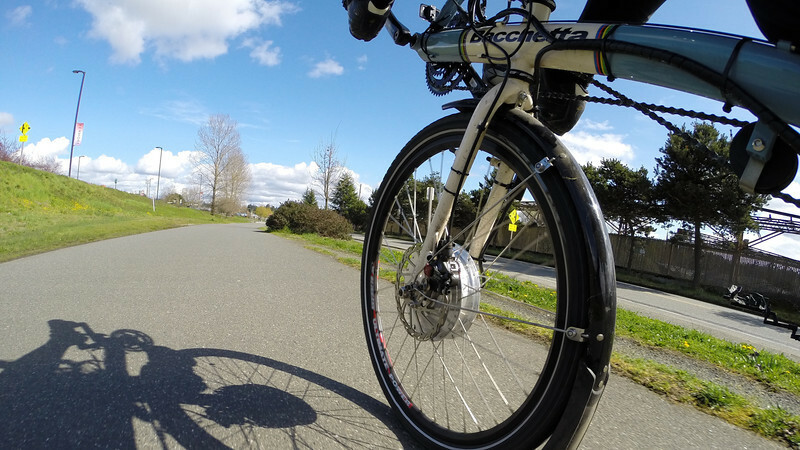 Recumbents are generally a little heavier than uprights, so the gearing is a little different. The only way up a hill is lean back, relax, and maintain a high spin, which be a precarious balance at low speed. I didn’t have an issue here on an upright, as I would frequently just stand up on the pedals and muscle through the steep sections along with pulling on the handlebars. 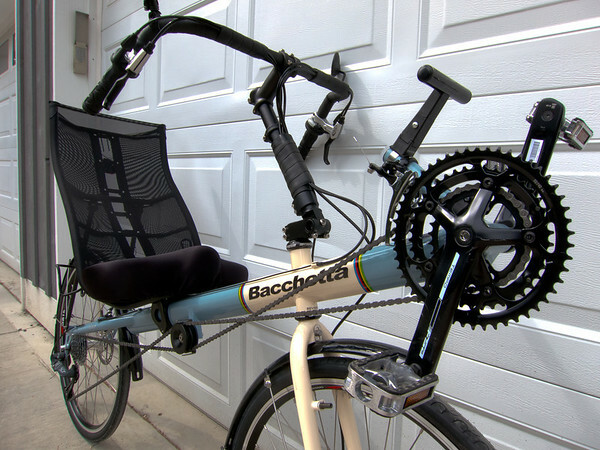 This particular recumbent is a Bacchetta Giro 26. 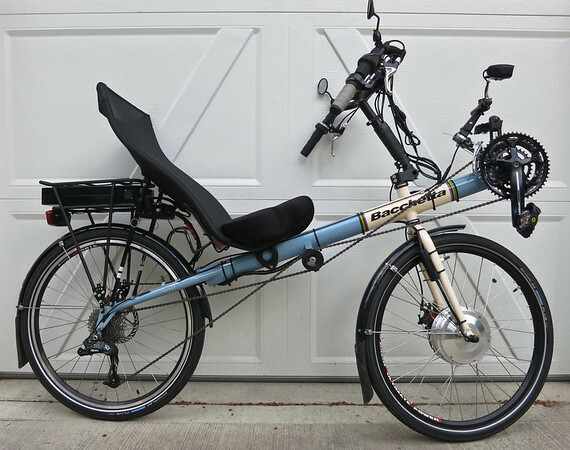 In the recumbent lexicon, it’s a high racer type with dual 26″ wheels and over seat steering. The Giro 26 is more suited to commuting and touring, and can accommodate different tire sizes depending on terrain. Bacchetta means â€œstickâ€ in Italian and the word is most commonly used at the racetrack to describe a jockey’s riding crop or whip. The Bacchetta company is actually based in Florida, and they grabbed the name because they liked the usage. Once you’re underway, the bike is dreamy to ride. You’re sitting down, light grip on the handlebars, pushing your legs forward, and you simply cruise along. My cruising flat speed is already on par with my upright speed. The key is getting launched: one foot on the ground, the other on pedal in push position, push off on the pedal, the other comes up and pushes down, and away you go. Theoretically. Takes a bit of balance to maintain direction and momemtum to get underway, and sometimes I’ll take 2-3 launch attempts before success, particularly when going uphill. I just swapped in SPD cleats, which provide greater grip and balance, along with more precarious extraction during emergency stops. Taking tight turns also requires a new technique. I’ve spent years on a upright keeping the inside knee high to avoid pedal scrapping on the turn and a possible crash. This recumbent requires the opposite: inside knee stays flat so that the handlebar can come over the leg to make a turn. I’m thinking that the turning radius is similar to my upright as long as I have momentum carrying through the turn. It’s just a new body language to learn. 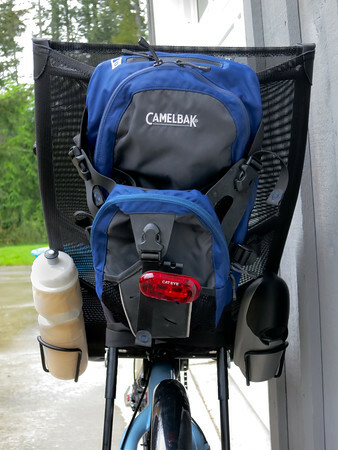 I attached my CamelBak Mule backpack to the rear of the seat by weaving the shoulder straps through the seat mesh, and wrapping the hip webbing around the seat frame. Voila! Plenty of storage for pocket items, and I could also put a water bladder back there for longer rides. Those of you who are fans of Eben Weiss’s Bike Snob NYC blog may recognize various tribes of bike-dom (check out the link to see where you fit in), now that I’m in the tribe of ‘Contraption Captains’, I will make this vow…I am not combing my beard. Or letting it grow any length where it requires combing. Promise.